My husband and I decided to create a Kallman Family Manifesto. Actually, I decided and he willingly played along. I’ve been wanting to do this for several years and now that my son is seven years old the time just felt right. 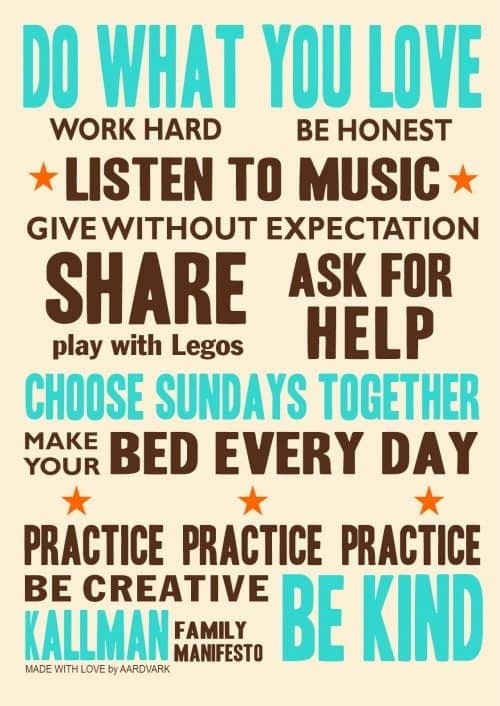 Stephen Covey loves his Family Mission Statement (which I find a bit too serious) and Gretchen Rubin of The Happiness Project has her Commandments (which are of a personal nature). I came across this charming corporate manifesto and was inspired by its playful tone to create our own. First thing we decided is that we wanted our family manifesto to be partially a reflection of who we currently are as a family and the values that are most important to us right now, with a hint of aspiration thrown in. Then my husband and I each came up with our own individual lists. Mine had 26 items on it. His had about 20. We picked our favorites from each others’ lists. Some didn’t make the cut. I was sorry to see “prune the roses” go. But Craig really didn’t appreciate it. And, it’s my chore anyway (which I love to do). Work Hard actually started out as Work Smart. Even though my husband (particularly him) and I have incredibly strong work ethics, we’re both much bigger fans of the work smart approach. However, we think that is a skill learned over time and at this stage we would prefer our son to learn to work hard. Do What You Love started out as Love Your Job. But my husband agreed with me that not everyone is fortunate enough to love their job and sometimes you need to accept a job to pay the bills. However, doing what you love isn’t necessarily about one’s job as it is about where you choose to focus your attention, and not limited to one’s career. Be Creative started out as something having to do with drawing and art, my son’s favorite hobby. We eventually agreed that creativity could be applied to the whole family (my husband and I can’t draw) and I personally liked the double meaning of the sentiment. At one point I mentioned to Craig that familial love was nowhere to be found on our manifesto and asked whether that troubled him. I wasn’t concerned since it seemed inherent. He agreed and other than pointing it out here we haven’t thought about it since. The last step of our process was our declaration. What’s a manifesto without making it public, right? So, I contacted Aardvark on Sea, creators of that gorgeous letterpress corporate manifesto, and asked if they could design a poster for me that we could hang proudly in our home. Letterpress (because of its cost) was out of the question, but the artists at Aardvark designed this digital print for us. Over dinner the other night my friend Carol asked me how we explained this all to our seven year old. Fair question. True, manifesto is a big word for a young child. Simply put, we told him the poster reflects what’s important and fun to us and ultimately makes us happy. Surprisingly, Make Your Bed Every Day made Ry smile. And every time I see the poster, play with the Legos just makes me smile. If you’re looking for some inspiration, I can’t recommend enough Gretchen Rubin’s The Happiness Project, which I was reading while working on our manifesto. Christine took the words right out of my mouth. This is fabulous. It reminds me a bit of the process my husband and I went through to create our ketubbah (Jewish wedding “contract”), but this would be great to do as a family. Fabulous! This is really inspirational. Totally doing this with my family. Thank you for this incredible idea. This is so brilliant in every way. Just like your family. Sadly, ours would be like “root for the Redskins” and that’s where Nate would end it. This is fantastic. I have sent it around to some non bloggy friends who are fired up about it. Thanks!!! my husband and I already have some house rules – though they’re longer and would be difficult to condense. I may have to give it a try, though – that looks gorgeous! I can’t tell you how much I love this idea! I recommend creating a family mission statement in my upcoming book, but I agree that the Covey version is a bit intimidating (this is a family, not a business). I’d recommended just writing down goals and values…but this takes it to the next level, especially for someone who is more visual. Love it! So absolutely fabulous, Isabel. All of your choices resonate strongly with me and our family values. And I love the mix of serious and cheeky. Plus? It’s gorgeous! Thank you so much for creating this and sharing it with us.